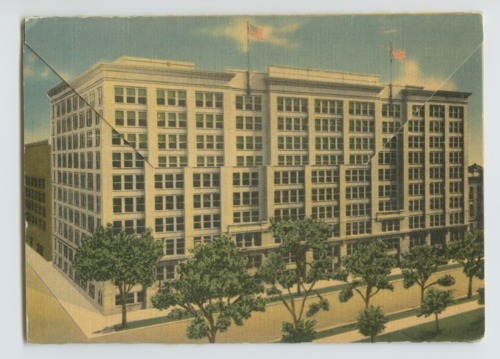 This collection of colored postcards shows a variety of scenes of Winter Veterans Administration Hospital in Topeka, Kansas. Dr. Karl Menninger was named the manager. Some of the images show veterans engaged in various activities. Images from the city of Topeka include the Atchison, Topeka, and Santa Fe office building and Topeka High School. One page of text is also part of the postcard folder.